"This elegant yet simple salad is lovely as a complement to a main course or on its own." Cook couscous according to package instructions. Put aside and allow to cool slightly. Meanwhile, place asparagus in a steamer over 1 inch of boiling water, and cover. Cook until tender but still firm, about 2 to 6 minutes. Drain and cool. 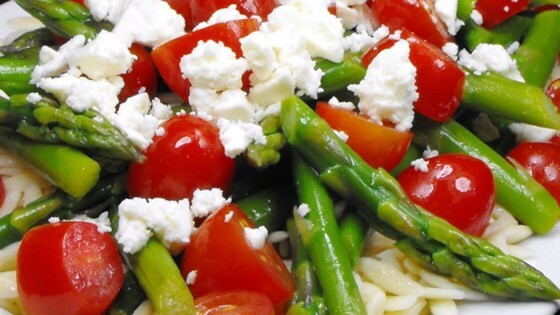 Toss the asparagus, tomatoes, and feta with couscous. Add the olive oil, balsamic vinegar, and black pepper and toss to incorporate. I made this recipe exactly as it is above and I felt like it was missing something. Sort of bland tasting. I used some roasted asparagus I had left over and it really made this recipe. Try with grilled or roasted asparagus for a fabulous variation. Only change I made was to scale it down slightly (a half cup of couscous is plenty for two as a side size portion) Great side dish! Thanks!